When it comes to the evolution of media, and the growing role of social networks in how the news is distributed, there is often a focus on trends in the United States and North America — the death of newspapers, the rise of Facebook (s fb) and Twitter, and so on. But at least some of these trends appear to be even more advanced in other parts of the world: for example, according to a recent survey of attitudes toward the media in a number of Arab nations, Facebook is one of the leading sources of news in countries like Bahrain and Tunisia. The survey was conducted by Northwestern University in Qatar, and involved interviews with more than 10,000 people from Egypt, Lebanon, Tunisia, Qatar, Bahrain, Saudi Arabia, Jordan and the United Arab Emirates (which includes Abu Dhabi and Dubai). 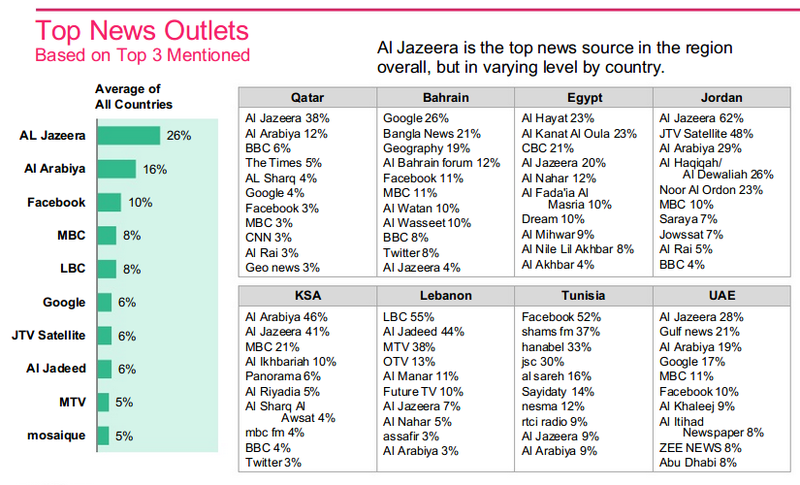 Although the Arab television networks Al Jazeera and Al Arabiya were the top source of news in most of the countries that took part in the study, on average Facebook was the third most popular. If you look more closely at the numbers, the average for Facebook is hugely influenced by Tunisia, where more than 50 percent of all respondents said the social network was their number one source of news — in Bahrain, only 11 percent said the same, while Facebook’s ranking in the UAE was 10 percent and in Qatar it was 3 percent. The only countries to mention Twitter were Bahrain, where 8 percent gave it as a top source, and Saudi Arabia where it had 3 percent. As a number of media theorists have described, social media’s effect on our news consumption is in some ways a throwback to the way news used to be consumed and distributed before newspapers existed — when coffee shops and other social outlets were the main source of information for communities (it’s also not clear from the study how much of what is shared on Facebook is news from a traditional source such as a newspaper or television network). What is clear from the study is that people in some Arab nations don’t trust the traditional media much at all, which could also be driving them towards social networks as a source of news: in Egypt and Tunisia — both of which experienced revolutionary uprisings as part of the Arab Spring — only a quarter of those surveyed said they thought the media was a credible source. Sociologist Zeynep Tufekci has written about how social-media use influenced the revolutions in Tunisia and other Arab countries, and how social networks helped to overcome some of the barriers that kept popular dissident movements in those countries from turning into revolutions in the past. Thanks, Paul — and those are some good points about the survey. I agree it overstates certain things, and probably understates others, especially given the wide disparities in internet usage among the different countries. I still thought it had some interesting results, and those disparities are part of the reason I said “for some” in the headline. Appreciate the comment though. Mathew, may I suggest reconsidering your conclusions â€“ especially your headline and subhead â€“ after taking a closer look at this study. First, the eight countries surveyed represent no more than half the population of the â€œArab worldâ€ â€“ less by some definitions. Second, the researchers aimed to interview the same number of people (1,250) in each of those eight countries. This dramatically over-weights affluent city-states such as Bahrain (one interview per 800 inhabitants over 14) and Qatar (1/1,200), and under-weights Egypt (1/42,000) and Saudi Arabia (1/17,000). Even so, only two-thirds of those interviewed in the eight countries say they use the internet. (In Egypt, by far the largest Arab country, the proportion is a mere 22%.) Of internet users, only two-thirds visit social-networking sites daily. By contrast, nearly everyone watches TV, and for reliability as a news medium, TV is ranked highest by 69%. The internet comes second at 54%, with radio (49%) and newspapers (47%) close behind. As for the most important medium for news, hereâ€™s the ranking: TV 83%, interpersonal contact 72%, internet 65%, newspaper 53%, radio 47%. Finally, although thereâ€™s obviously lots of suspicion of traditional media, 61% of those surveyed say the quality of news reporting in the Arab world has improved in the past two years. And Facebook? It only even gets mentioned as a news source in four of the eight countries. Those four account for just 18% of the total population of the eight, and less than 9% of the total â€œArab world.â€ Moreover, this was a question that asked people to list their top three news sources. Those who mentioned Facebook may have mentioned others as well. As for your subhead, â€œsocial media is much more influentialâ€ â€“ well, more influential than what, or where? In the Arab world, certainly not more influential than TV. About all you could say is that Facebook seems to be important in Tunisia. But note that the response rate in Tunisia was far lower than anywhere else — for every person who agreed to be interviewed, four refused. All of which is without taking into account differences in the availability of news sources and internet access across the eight countries surveyed, which probably influenced the results. And without asking just what it is that people mean when they say they use Facebook as a news source.